Decision 2003: What matters most to voters? Editors note: For the past month Yerevan journalists, including the staff of ArmeniaNow have been preparing a newspaper supplement aimed at helping voters make an informed decision in the February 19 Presidential election. The 60,000 copy special edition was prepared and financed by Irex/ProMedia, a media-strengthening program under the auspices of the United States Agency for International Development. 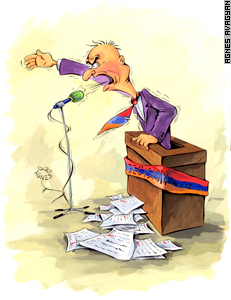 The eight-page election supplement was offered free of charge to newspapers and other media throughout Armenia. This week's ArmeniaNow will focus entirely on next Wednesday's election, using some of the main stories from the ProMedia project, and highlighting the most prevalent voter concerns. Businessman Vardges Amirjanyan wants the next President to give him a job. "Let them create working places, so that people don't leave their family and children and go to seek luck in strange lands," says Amirjanyan, 35, who had gone to Moscow to find work. "I am choking with nostalgia, but I have no other way out." After social conditions and unemployment, potential voters in a ProMedia survey named problems with the judicial system as being among their top concerns. Protection by the law, administered through its courts, is a right many citizens say they are not sure of but would like to be. "What elections are you talking about when I am the only member of our family staying in Armenia," says Nina, a Goris pensioner who like many relatives of the dispersed, doesn't know when her children and grandchildren will return.